Tom Petty is primed for the question. "You're into movies now?" "Yeah, that's me -- Mr. Hollywood," Petty says with a laugh. "But I really took the job because it was a small movie. I wouldn't be interested in doing a Steven Spielberg movie or anything like that." 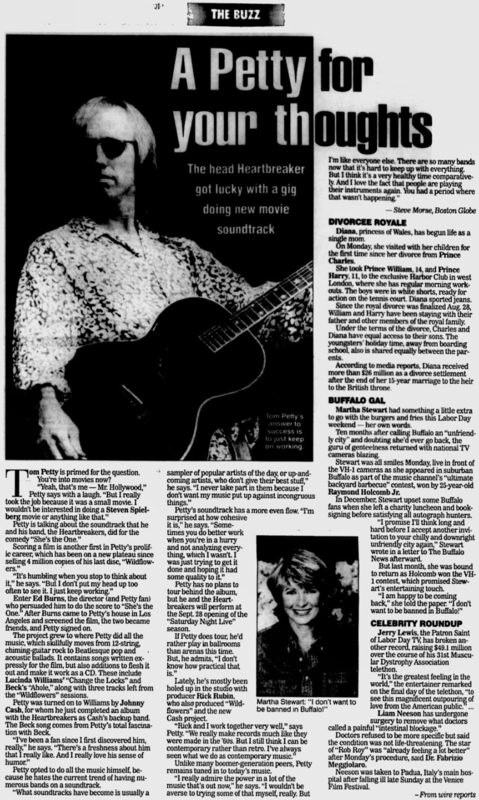 Petty is talking about the soundtrack that he and his band, the Heartbreakers, did for the comedy "She's the One." Scoring a film is another first in Petty's prolific career, which has been on a new plateau since selling 4 million copies of his last disc, "Wildflowers." "It's humbling when you stop to think about it," he says. "But I don't put my head up too often to see it. I just keep working." Enter Ed Burns, the director (and Petty fan) who persuaded him to do the score to "She's the One." After Burns came to Petty's house in Los Angeles and screened the film, the two became friends, and Petty signed on. The project grew to where Petty did all the music, which skillfully moves from 12-string, chiming-guitar rock to Beatlesque pop and acoustic ballads. It contains songs written expressly for the film, but also additions to flesh it out and make it work as a CD. These include Lucinda Williams' "Change the Locks" and Beck's "Ahole," along with three tracks left from the "Wildflowers" sessions. Petty was turned on to Williams by Johnny Cash, for whom he just completed an album with the Heartbreakers as Cash's backup band. The Beck song comes from Petty's total fascination with Beck. "I've been a fan since I first discovered him, really," he says. "There's a freshness about him that I really like. And I really love his sense of humor." Petty opted to do all the music himself, because he hates the current trend of having numerous bands on a soundtrack. "What soundtracks have become is usually a sampler of popular artists of the day, or up-and-coming artists, who don't give their best stuff," he says. "I never take part in them because I don't want my music put up against incongruous things." Petty's soundtrack has a more even flow. "I'm surprised at how cohesive it is," he says. "Sometimes you do better work when you're in a hurry and not analyzing everything, which I wasn't. I was just trying to get it done and hoping it had some quality to it." Petty has no plans to tour behind the album, but he and the Heartbreakers will perform at the Sept. 28 opening of the "Saturday Night Live" season. If Petty does tour, he'd rather play in ballrooms than arenas this time. But, he admits, "I don't know how practical that is." Lately, he's mostly been holed up in the studio with producer Rick Rubin, who also produced "Wildflowers" and the new Cash project. "Rick and I work very well together," says Petty. "We really make records much like they were made in the '60s. But I still think I can be contemporary rather than retro. I've always seen what we do as contemporary music." Unlike many boomer-generation peers, Petty remains tuned in to today's music. "I really admire the power in a lot of the music that's out now," he says. "I wouldn't be averse to trying some of that myself, really. But I'm like everyone else. There are so many bands now that it's hard to keep up with everything. But I think it's a very healthy time comparatively. And I love the fact that people are playing their instruments again. You had a period where that wasn't happening."